Moroccan food is renowned for being delicious, and the food on our trek is no different. Here we’ve detailed some of the staple foods that participants enjoy whilst on their trek and beyond! Tagines, Tagines and... more Tagines! Moroccan cooking is infamous for it's extensive use of spices, many of which are actually produced in Morocco. Ras-el-hanout is a famous Moroccan blend of 27 spices, which are the base of lots of the country's tagine recipes. A tagine is a Moroccan cooking pot, used to cook delicious, rich stews which are cooked for a long time over hot coals. This will be the main part of your diet during the trek, with tagines being served most evenings for dinner on your trek. You can expect both vegetarian and meat tagines to be offered, and the cooks prepare a particularly good lamb one! All the tagines you'll be served will be accompanied by heaps and heaps of cous cous! Cous cous is a great food to eat to fill you up and help you refuel for the next days trekking. Olives are a staple part of any Moroccan meal. On the trek you'll be offered lots of dried black olives, which will be cooked into your tagines. You can also eat amazing fresh olives in Imlil when you first arrive in country. Those of you heading to Marrakech at the end of your challenge will also be lucky enough to head to the souks and may stumble across traders hawking enormous piles of them - prepare to be amazed by how many varieties there are. If you’re spending time in Marrakech, make sure you take a few hours of your day for a long lunch or dinner. Before big meals it’s custom to share seven or so vegetarian salads. Each of these tiny bowls contain completely different but delicious varieties of hot and cold veggies and pulses. Particular favourites are a potato salad with lashings of cumin, french beans with harissa and Zaalouk, a smoked aubergine dish. These little dishes are perfect for scooping up with harcha (flatbread). 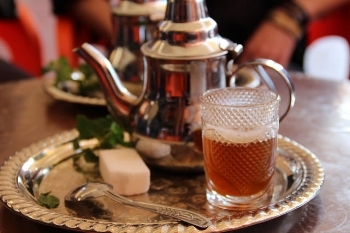 Berber Whiskey, or Mint Tea!